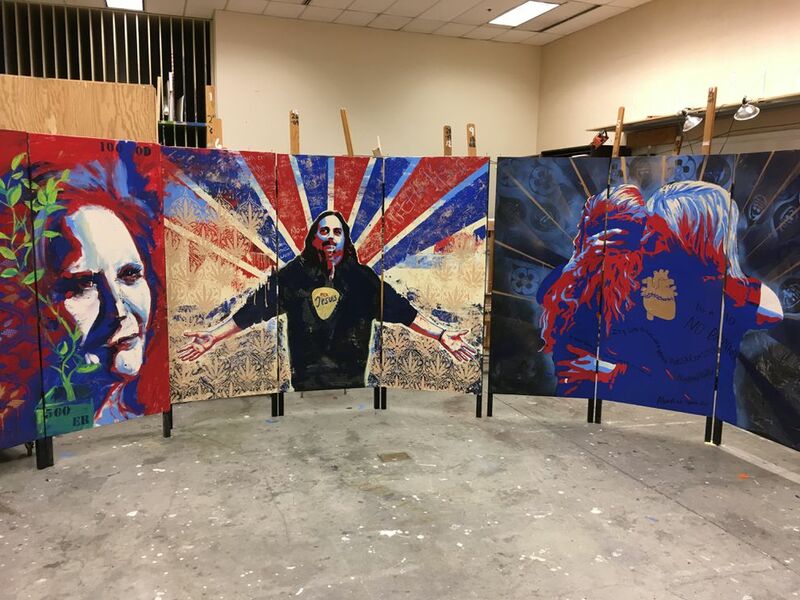 The homeless heroin addict I met at a UAA art class a few weeks ago came back Wednesday to see a finished mural by students inspired by her story. But she was keyed up with fear. 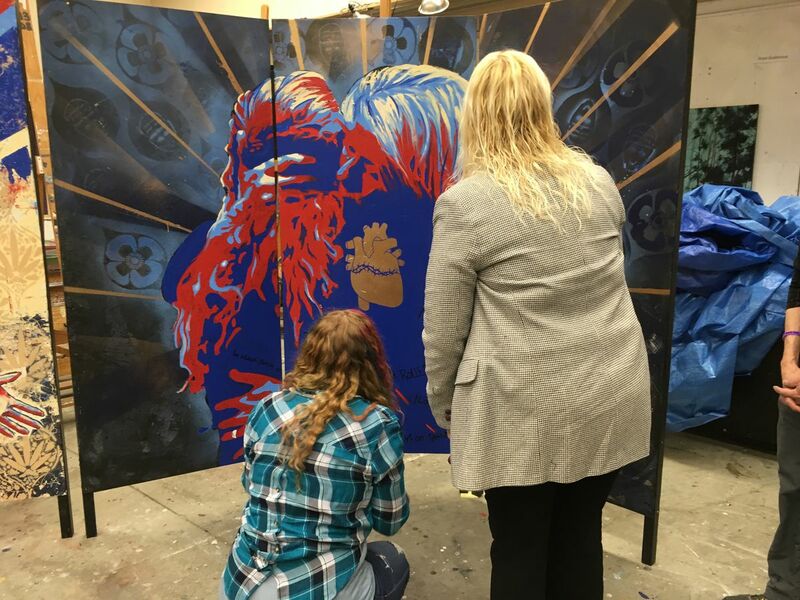 Last month I wrote about Kim Whitaker and her addicted daughter, and their heartbreaking hug in front of art students with clicking cameras. I am not naming the daughter at her request. The column helped bring about changes, including the daughter leaving a boyfriend she had been supplying with drugs by doing things she wouldn't mention. She moved indoors with a friend in a non-sexual relationship. She said she was ready for treatment. Returning to painter Steve Gordon's class to see a huge painting of the hug would be a joyous step in that direction. But when it was time to visit the class Wednesday, the boyfriend showed up at the house where she was staying, across town from his camp, beating on the window and demanding drugs. He had found her through her smartphone's locate function. Her heart raced. She said he has hit her in the past. Maybe she should give him what he wanted. To the side of the art studio, she asked her mother what to do. "He's found me. He's going to ruin treatment for me. He did it before," she said. Mark Weaver, a friend in his own long-term recovery, joined the conversation. With a calm voice and a slight smile behind his braided beard, he steadied her with a few words. His assurance carried the wisdom of one who had been in this situation many times before. "Just keep making the next right move for you," he said. "You know you're safe here." He reminded her of how her relationship with her mother had changed when Whitaker learned to set boundaries that would avoid supporting her addiction. The daughter suddenly seemed to understand. "So just don't budge," she said. "So tonight, I'll write down some guidelines, and I won't budge from them." The conversation turned hopeful. She said she would apply for a new ID the next day. "I can't wait to job-hunt not sick. I don't even know what that feels like," she said. Weaver knew. He got hooked on drugs as a kid, as she did. Drugs kept him, like her, from growing up. For decades. He went through countless rounds of rehab, recovery and relapse, stints in jail, and a successful business that he lost. Finally, he met someone who had made the journey ahead of him. 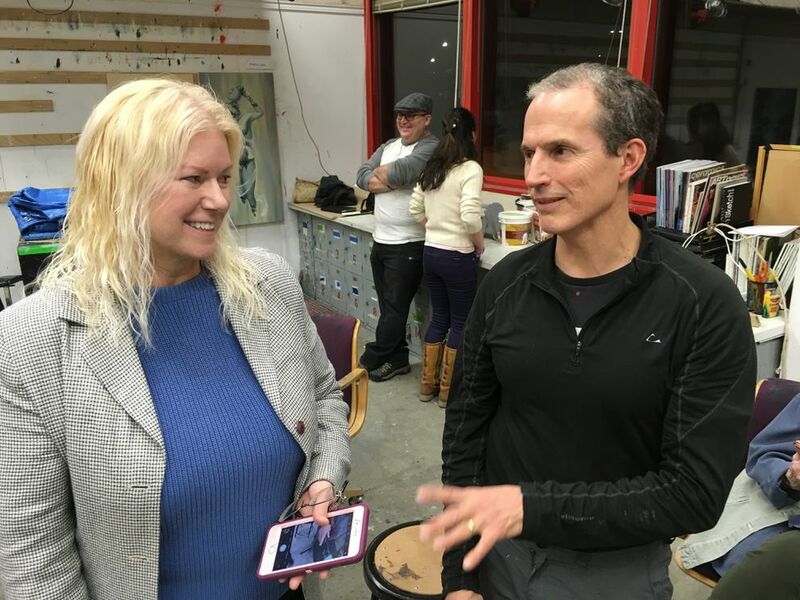 "What finally clicked for me was just having people who were living an honest recovery life, and weren't afraid to tell me the truth," he told the class at the session last month. Prayer kept him on that path. Now he helps people like Whitaker's daughter every day. He constantly hands out cards with his phone number. Last year he got calls from 200 addicts. Sometimes they work with him all the way through detox and into long-term recovery. "All these things in my story, I feel in my heart and soul, were preparing me for this, what I'm doing today," he said. 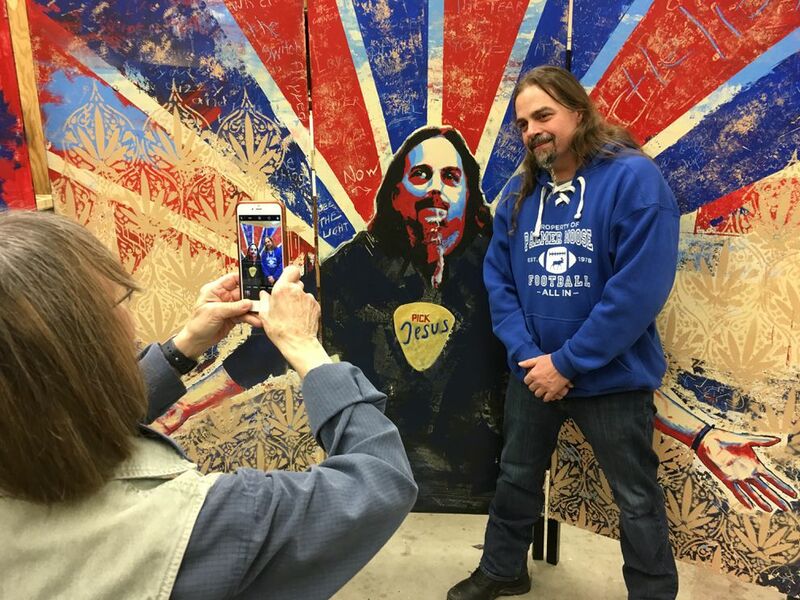 When he first came to Steve Gordon's art class last month, Weaver took the time to tell his story all the way through. The students listened attentively. Some wept. One came to him after class and now has entered a 12-step program. They asked him to try various poses, but settled on one with his face upturned and his arms outstretched. "As soon as they said, 'Hold your arms out like this,' I said, 'OK, you want me to do my Jesus Christ pose?' " he said. A student smirked at that reference to the title of a hard-driving 1991 song by Soundgarden. Weaver looks like a grunge fan. Maybe Jesus would be too. But Weaver is more than serious about his Christianity. He works through a Mat-Su-based group called Fallen Up Ministries. The mural exploded with hope, rays emerging from his head. Tiny crosses reflected in his eyes. Asked what it meant, student Sharon Dale said, "Mark's role as a savior to so many people." "Just being real about it, I have as many problems as anybody else," he said. "I'm a high-school kick-out. I never dreamed I'd be in a place like this, at UAA." The murals exude raw emotion, but Whitaker wondered if people would understand them. Out of context, they will be full of mystery. Words and symbols from each person's life float in the background of the three pieces, with meanings that are specific only for the subjects themselves and those who attended the meeting last month. But Gordon said that emotion — with its undefined specificity — may make the drug crisis real. He researched statistics before bringing the guests into his classroom. One hundred Alaskans dead of overdoses last year. But the numbers didn't tell the story. "These are real people," he said. "There's a lot of violence and hurt." Weaver's story and caring — and the others' — reached Gordon's students in a deeper way. Working in teams, they expressed those feelings in paint, which lives on. "Some assignments, like a bowl of fruit, you learn something from that," Gordon said. "But this is real life, real issues, real people. It's an opportunity to see the power of art." The power for one person was undeniable. Kim Whitaker drove her daughter home to her friend's house and then went to meet a client, as she calls the recovering addicts she helps as a volunteer. But first, on the way, her daughter wanted to stop at a drug store to print out pictures. She wanted to keep an image of how the students had seen her — how they had shown her hug with her mother, that love, in mythic scale, larger than life. I hope that image will help her stay on her path.